T.C. Williams' Jaquan Johnson-Terry leads the fast break against Annandale Thursday night. The Titans out-scored the Atoms 25-10 in the third quarter. With Annandale playing well and his team looking listless down 28-20, T.C. Williams coach Darryl Prue didn’t have much to say to his team at halftime. In fact, the Titans returned from the locker room in about two minutes. Prue didn’t have to say much to get his message across. He just tinkered with the lineup a little and T.C. Williams looked like a different team in the third quarter, out-scoring the Atoms 25-10 to race to a lead it would never relinquish. 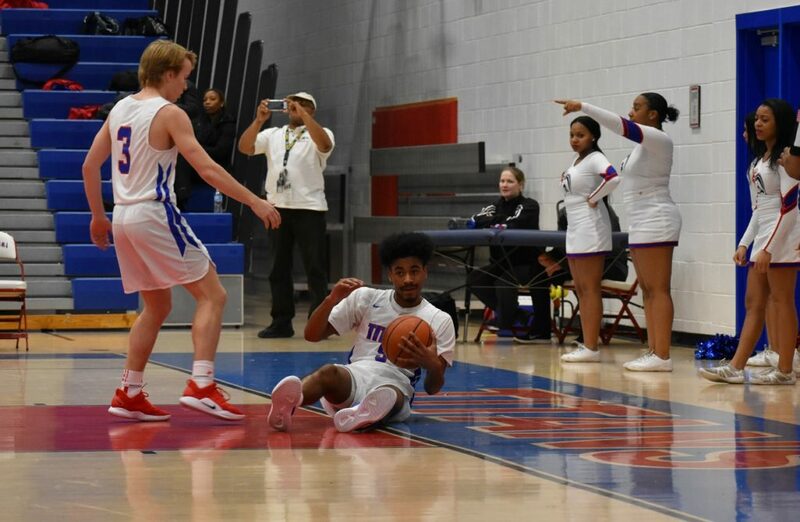 The end result was a 61-56 home Gunston District victory. Sophomore guard Tekao Carpenter (14 points) asserted himself off the bench for T.C. The damage was done in lightning-quick fashion. After a couple of T.C. Williams baskets and an Annandale free throw, sophomore Tekao Carpenter hit a three-pointer to make it 29-27, Atoms. Junior Ricardo Ross hit a lay-up to tie it up. 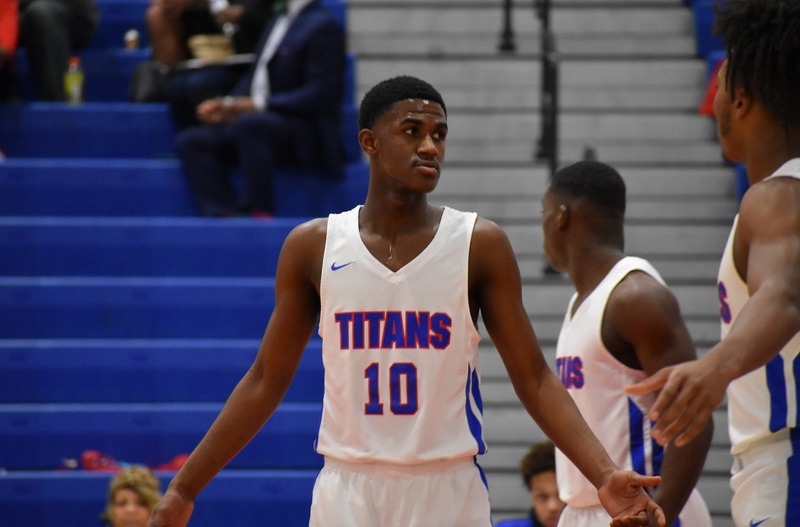 The Titans’ defensive pressure started to force turnovers, and seniors Jaquan Johnson-Terry and Chris Wells delivered buckets to make it 33-29 Titans with 4:20 left in the third quarter. Annandale was reeling, the victim of a quick 13-1 Titans run. The Atoms took a time out and stabilized things but a few minutes later Johnson-Terry stole the ball. He missed a shot but Ross rebounded the miss and found senior Sean Walsh open for a three. Walsh buried it to give T.C. Williams a seven-point lead and the crowd celebrated the results of the home team’s suddenly aggressive play. Annandale (1-3, 7-10) didn’t quit to its credit. A Junior Lotongo steal and dish to Jalon Lipford got the Atoms to within two with about three minutes left in the game. 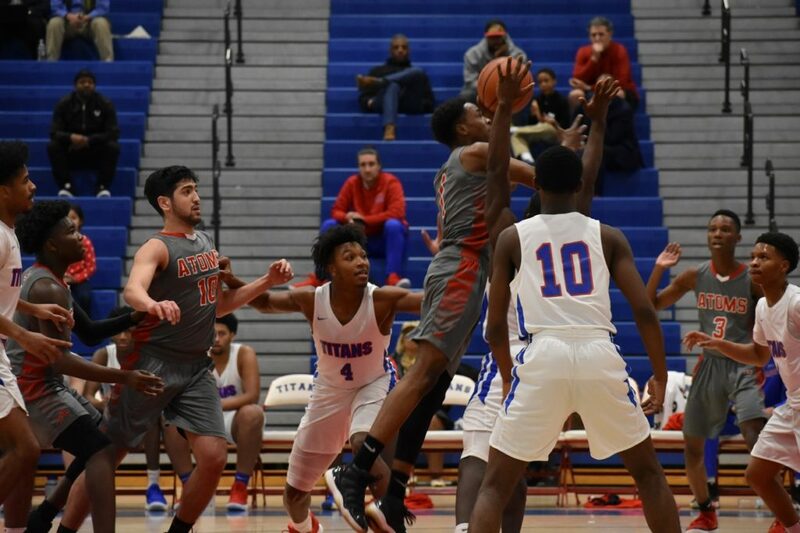 But down the stretch the Titans buried their free throws while Annandale could not take advantage of its opportunities there. The Atoms were 11-23 on the night from the charity stripe. The Atoms’ Jalon Lipford (16 points, 13 boards) elevates to the basket. Lotongo led Annandale with 21 points, while fellow senior Lipford had 16 points and 13 rebounds. That starting backcourt can be almost as dynamic as any in the area when they’re on. Carpenter led T.C. Williams (3-1, 8-8) in scoring off the bench with 14 points. 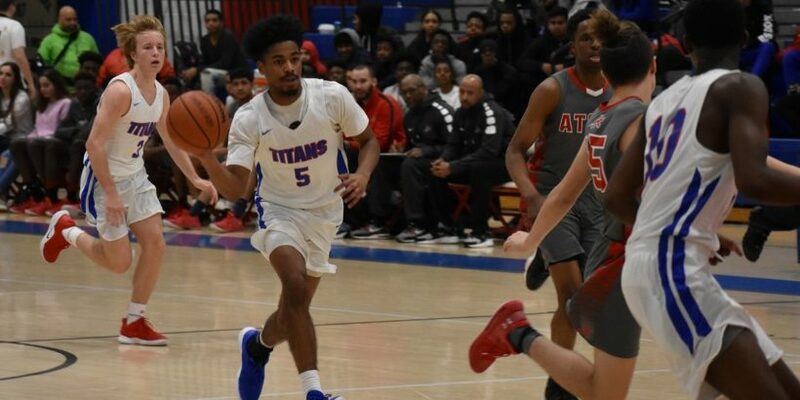 Johnson-Terry, a guard known for his scoring prowess, had just 11 points but impacted the game in a big way with his defense and handling the ball (four assists). Eight players total scored in the Titans’ balanced attack. Prue’s team has been inconsistent all year but when they’re firing on all cylinders, like in the third quarter, they can beat just about anyone. Sean Walsh helps up Jaquan Johnson-Terry after he takes the charge.